Yes, it’s a thing! You can succeed in the kitchen if you become more efficient. Efficiency will give you more TIME for yourself. That’s what you want, right? So, here are my tips on how to be productive in the kitchen. Tip 1: Plan – It’s a simple 4-letter word, but it is pivotal when it comes to efficiency! If you don’t have a plan, you’ll just end up wasting more time in the kitchen. Wasting time = no good. Your plan should include the following: picking a day to grocery shop, deciding how many meals you want to cook, finding the recipes you want to execute and choosing which days you want to cook/prep. There, you’ve got a plan! Tip 2: Prep – Similar to planning, but prepping here means, getting organized! Once you’ve got your recipes and groceries, why not start chopping or gathering things so that you can have them ready when needed. It’s called mis en place, everything in it’s place! Every good restaurant kitchen relies on preparation! Tip 3: Proceed – Now that you’ve planned and prepped, you can proceed. So clever, right? I love my “P” lists! Proceeding means, get in the kitchen and get to work. Stop goofing around on your phone. Stop cleaning your house. Stop yelling at your significant other or kids and GET IN THE KITCHEN. Turn up the good music, put on your apron and clear your counter and start cooking! Now you know I love pizza, but sometimes it just isn’t feasible to make the dough, let it rise, chop all of the stuff and then assemble it. I mean, I’m pretty efficient, but that’s a lot of steps, right? So, that’s why I came up with this naan pizza! The dough is already made for you – thanks to awesome purchased whole wheat naan bread – so that’s a huge time saver. This means it’s all about the toppings. 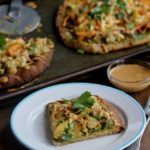 This Sriracha Peanut Naan Pizza has 2 sauces, but I promise they’re super easy and only take a few minutes. You can even whip them up while the pizza is baking. Then it’s just a matter of slicing up a pepper and smashing some chickpeas. See? Easy! Now that you know how to be efficient, it’s time to get your recipes collected and grocery shopping done. Why not add this recipe to your list!? I promise you’ll love it. And since I’ve got you, why not share how you like to build your pizza in the comment section below! Perhaps you have a few things you could teach us! 🙂 Happy pizza making! Looking for a flavorful dinner that comes together FAST? 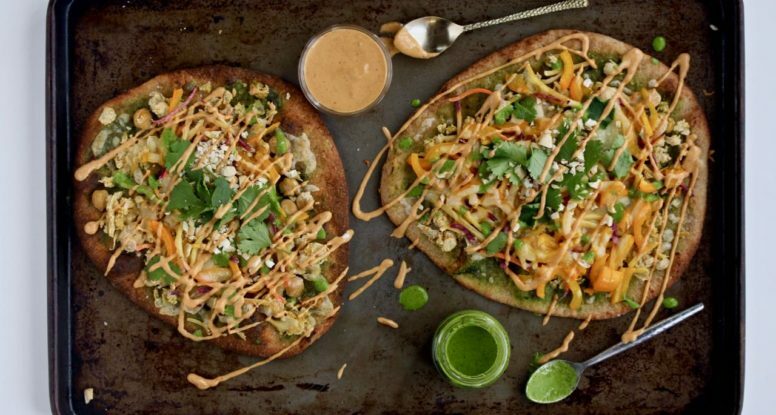 Look no further than this Sriracha Peanut Naan Pizza! In a blender or bowl of a small food processor, combine the cilantro, olive oil, water and garlic. Puree until smooth. Transfer to a bowl. Clean out blender or food processor, then add the peanut butter, sriracha, soy sauce, and lime juice. Puree until smooth. Set aside. Place naan on a baking sheet and bake 3 minutes. Remove naan from the oven, then drizzle each lightly with half of the cilantro mixture. In a small bowl, smash garbanzo beans with the back of a fork. Stir in salt then spread smashed beans on top of each naan. Top with carrot, bell peppers and cheese. Return to oven and bake 5-8 more minutes. Remove from oven, slice as desired then drizzle with remaining cilantro mixture. Garnish with peanut dressing, cilantro and chopped peanuts. Any extra sauce can be used for salads or noodle dishes! This is such a creative, fun pizza idea! 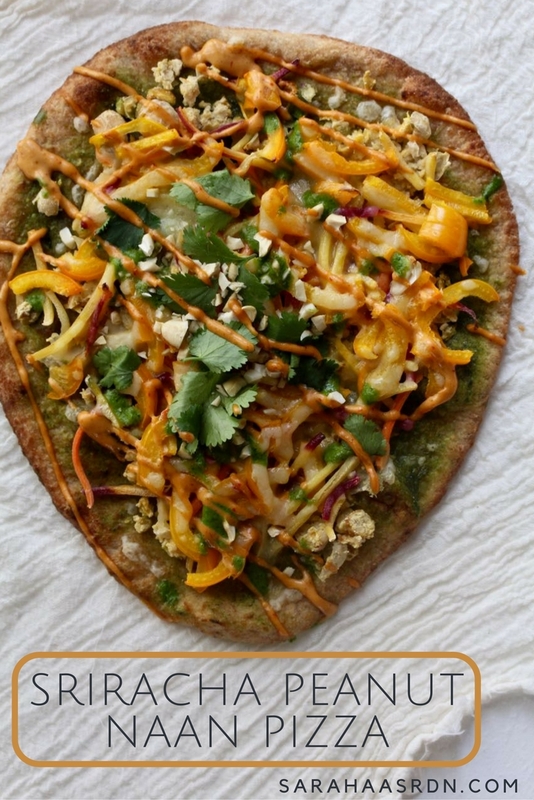 And I totally agree- using naan is such a time saver for those busy weeknights! This loooks amazing Sara! And I of course agree with your 3 Ps and the use of ingredients like pre-baked naan to make pizza. Cannot wait to try this! One question – I find when I mash chickpeas that the skins come off and it’s not the most pleasant to eat those. Do you experience this? and what do you suggest? I love all of these flavors, Sara but never thought to put them on a pizza. Pinned it to try with one of the many whole grain naan (naans? LOL) in my freezer!